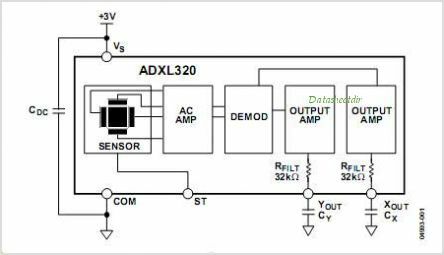 The ADXL320s typical noise floor is 250 g/Hz, allowing signals below 2 mg to be resolved in tilt-sensing applications using narrow bandwidths (<60 Hz). This is one package pinout of ADXL320,If you need more pinouts please download ADXL320's pdf datasheet. 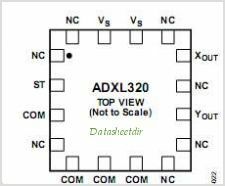 This is one application circuit of ADXL320,If you need more circuits,please download ADXL320's pdf datasheet.